We’re back and, as is traditional, we return with something brilliant we missed from last year! With all this beautiful free time and a very limited release schedule, December is just prime for making you look back over the year gone by and wonder how on earth you missed so many things! 2014 was already an amazing year for women in music, and 2015 is shaping up to be defined by the ongoing revival of the Riot Grrrl sound and crucially ethics, which is where Alynda and co come in. Whilst her music may not openly shriek anger in the style of Meredith Graves or Kathleen Hanna, on tracks like standout, The Body Electric, the rage quietly drips through. Describing the track Alynda stated “it was anger, a desire for justice and a dream of change.I hope this song breathes power and humanity back into all people who feel targeted by violence and oppression. Whether they exist in our old stories and songs or are marching in protest as we speak.” She backed up those words by crowd-sourcing a video to highlight the ongoing issues of violence on the grounds of gender and race. The excess money raised was then donated to a series of related charities. In an era where far too many celebrities are scared to even express an opinion, how wonderful is it that the underground is full of people who actually care, and want to make the world a better place! All of which would be nothing more than a well-meaning aside if the music wasn’t any good. If her ethics, morals and outlook were shaped by New York, her music is deeply routed in her new home of New Orleans. She’s a husky voiced jazz vocalist, playing acoustic-blues songs with a band of country musicians, and it’s a classic sound given a gentle, subtle and tasteful make over. Alynda and her band of superbly talented musicians are gently shaping the rich musical history of the Deep South into their own image. So there’s upbeat rhythm and blues numbers which Jools Holland would give his right arm for, but there’s also delightfully stripped back blues ballads where there’s just a deeply emotive vocal and a few picked chords on an acoustic guitar. Modern country stormers in the mould of Caitlin Rose and even the odd lounge jazz number which sound a bit like the best Norah Jones song you’ve ever heard. A series of rich tapestries on which Alynda weaves her tales of oppression and heart-ache. Levon’s Dream is a lullaby built around gently strummed acoustic, waves of strings, accordion, plaintive piano lines and a delightfully sleazy electric guitar. There’s even a spoken word bit, it should be impenetrably dense but everything’s so perfectly balanced that it works stunningly, carried more than anything by the quality of the vocal, as Alynda sings the songs closing refrain “I’m heartbroken and through, trying to hold onto you, I’m heartbroken and through and it’s all over you” over a wall of rapidly plucked electric noise it’s a truly wonderful thing. If the quality of the musicianship on show is never in doubt, on the likes of St. Roch Blues it’s also impossible to ignore the stunning quality of the lyricism. It acts as both a warning about, and a love song to, New Orleans. For any artists in Louisiana it’s pretty much impossible to not be affected by the terrifying fall out of Hurricane Katrina and the legacy it still has on the people who were there, a chilling reminder not to romanticise what you don’t understand, as Alynda and guitarist Sam Doores harmonise beautifully “baby please don’t go down to New Orleans, cause you don’t know the things I’ve seen.” Elsewhere the song is littered with references to “bullets flying from young mans hand” and “people are dying” as “no-one understands.” The reality of course is that it’s not a plea to stay away from the place, but a plea to understand just what’s made New Orleans and it’s people what they are, to acknowledge the pain of a city that still mourns those who could still be with us. It’s a deeply moving piece of song-writing. The album skirts around the history of the South, flitting from genre to genre without ever sounding derivative or like a pastiche. Blue Ridge Mountains is as deeply rooted in the traditional sounds of Appalachian folk as you’d imagine, the title track Small Town Heroes marks Levon out as an American equivalent to our own Laura Marling, whilst Good Time Blues (An Outlaw’s Lament) is anything but a good time, a gorgeous woozy, blues track, the vocal take on which is a thing of such simplistic wonder that it sounds utterly effortless and unfeasibly beautiful. 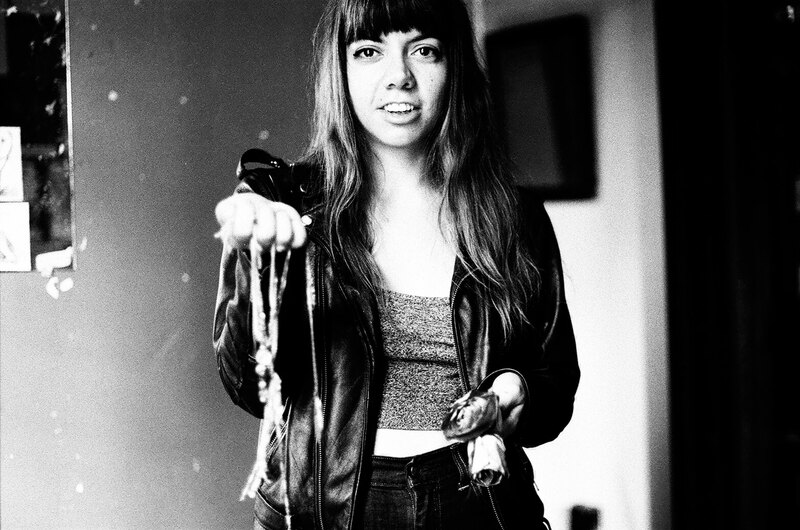 The perfect amalgamation of what makes Hurray For The Riff Raff such a wonderful prospect might just be the stunning single and Small Town Heroes centerpiece, The Body Electric. A classic murder ballad with a crushing twist. Written in response to seeing a crowd of people cheer for a song-writer telling the classic tale of shooting dead the cheating woman who done him wrong, Alynda questions the inherent misogyny in the old tale. The track asks us to think not about the man who was “wronged” but about the woman who was the victim of the mindless violence “he shot her down he put her body in the river, he covered her up, but I went to get her, I said my girl what happened to you now? I said my girl we got to stop this somehow!” It all builds to a chorus, that is both harrowing and ludicrously catchy, as a percussive guitar guides us to the repeated phrase “tell me what’s a man with a rifle in his hand, going to do for a world that’s so sick and sad” and twists it back on the perpetrator, or perhaps on society as a whole as she asks “what’s a man with a rifle in his hand going to do for his daughter when it’s her turn to go?” It’s both a deeply refined piece of song-craft and a deeply arresting take on a tradition that we have for too long accepted. Over the course of this stunning album Hurray For The Riff Raff make music that’s not just for your shuffling feet, your beating heart and your gut, but for your mind too. The sort of record that makes a mockery of the idea that nobody writes anything important anymore, it’s a masterpiece!